Botanically; orange is the citrus fruit belonging to the Rutaceae family, of the genus; Citrus. 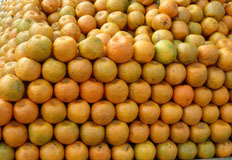 The family also includes other related species of oranges such as pomelo, tangerine (mandarin orange), yuzu, lemon, and grapefruit. Orange is a tropical to semitropical, evergreen, small flowering tree, growing to about 5 to 8 m tall, and bears seasonal fruits that measure about 3 inches in diameter and weigh about 100-150 g. Oranges classified into two general categories, sweet and bitter, with the former being the type most commonly consumed type. Traditional sweet varieties include Valencia, Navel, Persian variety, and blood orange. Photo courtesy: orphanjonesNagpur (India) orange. Tangerines are related varieties of oranges distinguished by loose, easily peeled skin (pericarp) and sweet juicy flesh (arils). They are also known as mandarin oranges in Europe and Satsumas in Japan. Just as oranges, they too belong to the Rutaceae (Citrus Family) and known scientifically as Citrus reticulata. Fruits belonging to the citrus group described as “hesperidium,” (A hesperidium is a scientific term to describe the fruit structure belonging to the citrus group. In fact, the fruit is a modified berrywith tough, leathery rind. Orange peel contains many volatile oil glands in pits. Interior flesh is composed of segments, called carpels, made up of numerous fluid-filled vesicles that are specialized hair cells).